''A. Please read this manual carefully before power on the device. 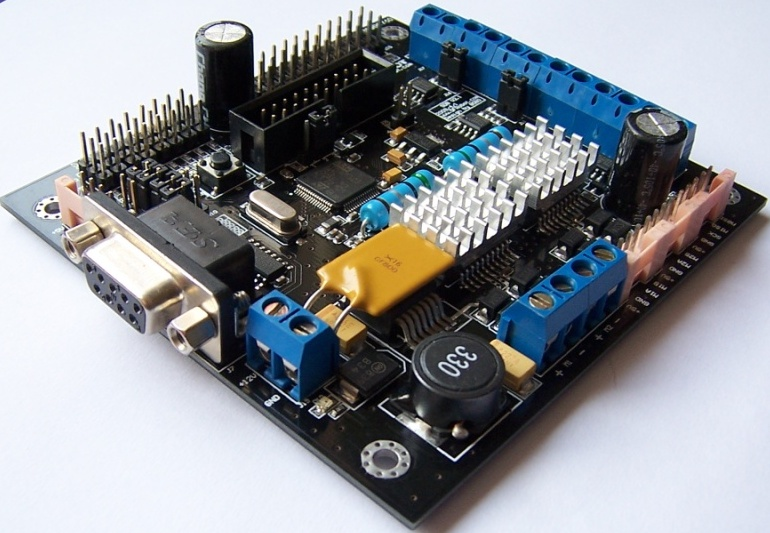 Dual 4 Amp H-Bridge: Control 2 DC motors with A/B encoders interface. Integrated PID speed *control. Support odometer and motor current reading. 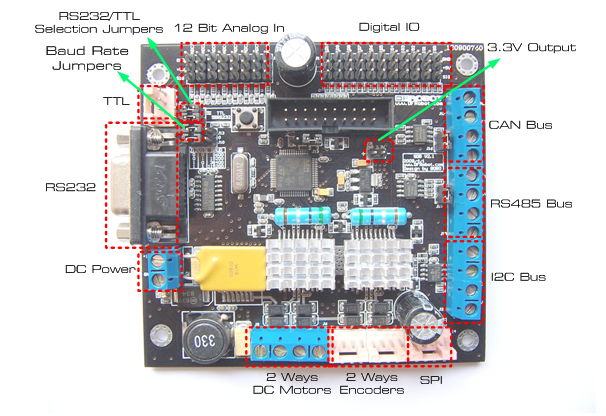 The SDB board supports RS232/TTL interface. The RS232/TTL output mode is selected by jumpers. All commands are in Hex format. All response is terminated by a 0x0A (Line Feed) at the end of the data. This command is used to configure the DIO to servo control mode. The I/O status byte is calculated from Bit0:Bit7 which is mapped on IO0-IO7. When the IO Bit is set to 1, the servo mode is enabled. When IO bit is set to 0, the servo mode is disabled. And the I/O status byte is 00011000 = 0x18. This command is used to set Digital Pin to input or output mode individually. To set IO 1,2,9 as output, the rest IO as input. When the Bit is set to 1, the output is HIGH, When the Bit is set to 0, the output is LOW. NOTE: If one of the DIO is configured as Digital Input Mode, the command to set its output will be invalid. This command reads the value on DIO when they are configured as Input Mode. This command moves the servo at specific speeds. After configuring the DIO0-7 to Servo control mode, this command is used to play the Servo with position and speed control. "S0 Pos" is the position value of the servo. The value is from 0 to 180, and 90 is corresponding to the center position. "S0 Speed" is the speed value of the servo. The value is from 0 to 0xFF, and 0xFF stands for the highest speed. This command reads the values on analog pins. This commands set the baud rate for RS485 Bus. This command transmits the data via RS485 BUS from RS232/TTL. The length of data must not exceed 64. The response data is transmitted to RS232/TTL. 0x00 0x09 is the return distance data which is 9 cm. This command writes data to device via I2C. The total data length must be less than 64 bytes. This command reads data from device via I2C. The total data length is less than 4 bytes. This commands set the parameters for DC motor speed control. This commands set the speed of motor. M1_SPEED/M2_SPEED consists of two bytes (HIGH and LOW). For a 132 cm/s speed, the M1_SPEED will be 0x00 0x84. MOTO_DIR is direction control. The low 4 bits of the byte is for the direction of Motor 1. The high 4 bits of the byte is for the direction of Motor 2. The actual value of the MOTO_DIR will be 0xF0. This command reads the motor current. The current value is 16 bit which consists of two bytes (HIGH and LOW). The current unit is mA. Value: 0X00 PID speed control. This is a close loop control method. The parameters for the motors must be :set for proper speed control. Value: 0X11 Direct power control. This is an open loop control method; the parameters do not affect the motors. This commands set the power of the motors. The value of power ratio S1/S2 is from 0-200. 100(0x64) stands for a full stop. 200(0xC8) stands for the maximum forward power. 0(0x00) stands for the maximum backward power. M1_ENCODE、M2_ENCODE：Two bytes 16 bit value。Represent the rotation counter of the motors. When change the direction of the motor, the encoder needs to be reset. This commands reset the encoder’s counters. This command reads the board version. 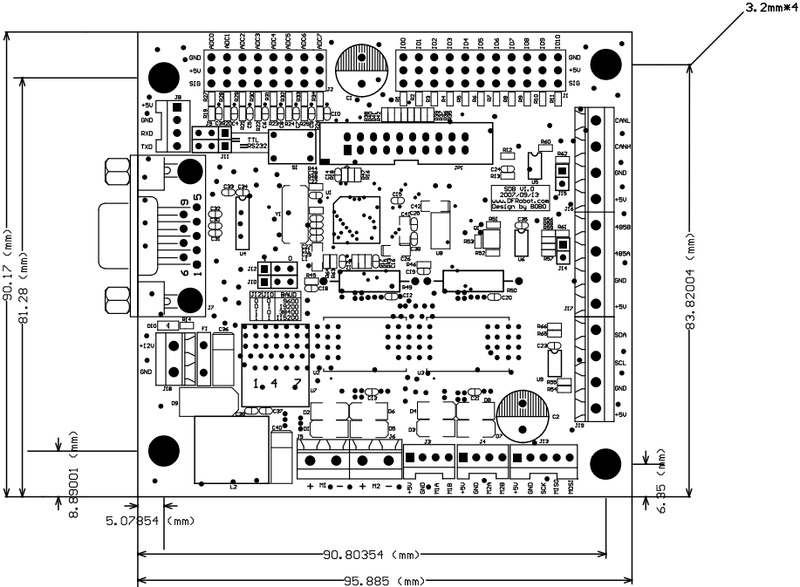 Get Sensor/Motor Drive Board - Version 2.2 (SKU:DFR0057) from DFRobot Store or DFRobot Distributor.